The portrayal of Native Americans for the Trojans, however, is truly troubling, whether it’s done as a lark or with the best of intentions—specifically, the best of a white person’s intentions. Cressida (Kate Valk) and Troilus (Scott Shepherd) converse as Pandarus (Greg Mehrten) listens outside their teepee in the Wooster Group's production of Cry, Trojans! at St. Ann's Warehouse. Photo by Tim Hailand. Call me a conservative theater purist (a label that is in itself contradictory because theater never has been “pure”) resisting envelope-exploding concepts, but when I encounter a palpable “aren’t we cool and clever” aesthete surrounding a production such as Wooster Group’s Cry, Trojans! at St. Ann’s Warehouse, I consider the whole thing little more relevant than lighting farts. Call me a liberal weeny, trigger happy with racist finger-pointing but blind to my own prejudices, but while I’m all for holding mirrors up to racial stereotypes, I don't want to look through those mirrors and see nothing but white faces, as I saw in this Native American–themed adaptation of William Shakespeare’s Troilus and Cressida. With Troilus and Cressida, Shakespeare wrote a proto-Brechtian drama exploring the empty reality of a nation’s mythology-based heritage while portraying the enduring dissonance of a warrior class mentality built on honor and whoring. With Cry, Trojans!, Wooster Group has turned this brilliant work into little more than theatrical masturbation with racial overtones. Yes, but is it Shakespearean, Eric? Well, cut through the production’s self-aggrandizing crap, and you will find some Shakespearean merit buried there. The production was birthed as part of the 2012 World Shakespeare Festival celebrated in conjunction with the Olympic Games in England. The Royal Shakespeare Company and the Wooster Group partnered on a production of Troilus and Cressida in which the RSC staged and played the Greeks while the Wooster Group presented the Trojans. The two companies meshed their productions into one that played limited runs in Stratford-upon-Avon and London. The Wooster Group chose to present the Trojans as Native Americans, the RSC as modern British solders. For the sake of accountability, I should point out that the production suffered a mostly critical drubbing and, according to news reports, a high degree of intermission walkouts, neither of which factor into my assessment of the current Cry, Trojans! incarnation (the walk-out ratio for the performance we attended was close to 20 percent; high, but not the highest we’ve seen). Wooster Group Co-founder Elizabeth LeCompte, who directed the original project along with the RSC’s Mark Ravenhill, restaged the play under the title Cry, Trojans! with almost the entire focus on Shakespeare’s Trojans. After a workshop production in New York, the production premiered last winter at REDCAT in Los Angeles before returning to New York for a run at St. Ann’s Warehouse in Brooklyn, where we saw it. For those scenes in which the Trojans interact with the Greeks or key scenes in the Greek camp needed to make sense of plot developments, the actors wear black masks while doubling as the Greek warriors (and Helen in Troy) and speak with British accents—all while a soundtrack of the original RSC cast's dialogue plays over the sound system like an incongruous echo. Supplementing the actors are video screens playing scenes from Hollywood movies depicting various Native Americans, including Nanook of the North, as well as Splendor in the Grass. Multimedia presentations are a signature element of Wooster Group productions, and five technicians sitting at three consoles around the thrust stage manage the various lighting, visual, and sound effects; they even join the cast on stage during the curtain calls. Avant-garde theater can be cool, and turning Shakespeare inside out can be enlightening and entertaining; but piling on audio that drowns out the language and shoving visuals into the space because you can is not clever, it's excess. Especially as the point of all this extraneous matter is as dubious as the Venus de Milo statues that serve as the Trojans’ armor (need me to repeat that? The Trojans wear Venus de Milo sculptures on their backs when they go to war). Are such ideas germane to an overarching theme or message? These shredded and reddish-colored statues could be a metaphor of war’s destruction of culture, or it could be a sly reference to Shakespeare as a classical icon being co-opted for a totally different cultural purpose, as a tool for war or maybe a defense from attack. On the other hand, it could also simply be the result of an idea tossed out during a fourth round of drinks: “Hey! Let’s throw a Venus de Milo on their backs as armor! Why not?” So the joke is on us, thank you very much. Giving Troilus and Cressida such a conceptual setting is not an issue for me. I’ve seen the play set in the Crimean War and in the Iraqi War (as well as in historical garb and Elizabethan costume), and such presentations bring to the surface Shakespeare’s cynicism-laced study of waging long, seemingly pointless wars while those in the fight try to maintain at least a modicum of honor and grace in the face of such senseless conflict. The Native American story is far more than a tragic tale of colonialism; relative to the mythology of the Trojan War, it is the history of peoples defending their lands against a suffocating siege and preserving their place in the palette of civilizations. Parallels abound, from the war councils questioning the point of continuing the fight to the formal summits between the two armies. We can also look beyond the play to the ultimate end of the Trojan War: the destruction of the community, the massacre of its men, women, and children, the removal of its few survivors. Now, however, I will take off my Shakesgeek hat and put on the mortarboard of a journalist who earned his master of humanities degree in disabilities studies. My thesis was a comparative study of Hollywood’s portrayal of Native Americans and of people with disabilities. For the purposes of this discussion, grant that I adequately established both the reason for comparing the two populations and the comparison of portrayals (my arguments passed muster with my thesis committee), and let’s move directly to the nature of Hollywood portrayals that historically were—and generally still are—based on not just stereotypes but historical revisionism and cultural conglomeration. The Native American portrayals in Cry, Trojans! were intentionally Hollywood-tainted. A teepee sits at the back of the stage (with smoke whisping up out of the top via an image on a video screen). A wagon wheel and other junk are piled up on one side. The Trojan women are dressed in buckskin, the warriors in psychedelic garb reminiscent of Plains Indian horsemen with headbands and feathers. They use lacrosse sticks as their weapons. They speak Shakespeare’s verse in either atonal Tonto-talk or in a sing-song inflection, depending on their roles. The warriors literally shuffle off to war, hopping from foot to foot a few times before running off the stage as if they were prancing horses before the gallop. Greg Mehrten, playing Pandarus as the wise but earthly cynical tribal elder, is the performance that most troubles me, in part because it seems so authentically Indian. As I watched his character evolve, I found it an interesting, even enlightening, take on the role, but all the while I wondered how much of it was informed by a real Native American or by stereotype. It turns out that it’s the latter. LeCompte deliberately uses the Hollywood stereotypes (reinforced by the video images above the stage) as a commentary on such stereotypes—throwing our own racism back in our faces. Wooster Group has skated this ice before, staging Eugene O’Neill’s The Emperor Jones with Kate Valk, a white woman, playing the title role in black face, which is, literally, an in-your-face commentary on racism. But the device backfires with Cry, Trojans! Certainly, Mehrten’s portrayal of Pandarus forced me to reflect on my own racist stereotypes, but it did so specifically because my own master’s research led me to question the validity of his portrayal. The damning truth here is not my own racism, which I recognize, but the portrayal’s, which many people may not recognize. Whenever heterosexual, white, Anglo-Saxon Protestants tackle racist or discriminatory matter of a disenfranchised population through co-opting racist and discriminatory imagery, they end up perpetuating those stereotypes. In fact, I think straight WASPS (I am one) have no business trying to channel the victimization of people at the wrong end of social discrimination because we inevitably do so through our own inexperienced perspectives. It doesn’t matter how much we read, study, empathize, or have friends, spouses, or children who are of a different race, ethnicity, gender, or sexuality than us: we still do not live the discrimination and stereotypes they endure. Rather, we should provide a channel for those people who are victimized to get their own story out. In the case of Cry, Trojans!, why not cast Native Americans in at least some of the roles? Instead of utilizing Hollywood generalizations, why not set the play in a specific historical incident involving a Native American community reflective of Troy, such as the Washita River Massacre? In such ways would racism be told through the Native American perspective, not through WASP filters that, no matter how well intentioned, alter the story's tint. For those who would claim that using Native Americans in the cast or as creative consultants would smack of tokenism, I counter that such a claim would smack of head-in-the-sand elitism—or, at least, it reveals a desire to avoid the legitimate red flags such participants would raise. Since its Troilus and Cressida staging with the RSC, Wooster Group’s atonal performance of Shakespeare’s verse has been roundly criticized. However, aside from its stereotyped purposes, that method of delivery doesn't bother me. In fact, though it was intentionally Tontolized, the deliveries of Scott Shepherd as Troilus and Ari Fliakos as Hector are often mesmerizing (when you can hear them through the muddling sound effects). I am put off more by their affected British-accented deliveries. With the absence of the Greek scenes, LeCompte could hone the production’s focus solely on the titular characters in the center of the play, a real strength of this rendition of Troilus and Cressida. Valk plays a teasing Cressida in her courtship with Shepherd’s Troilus, and they have a childlike quality when their attention turns on each other. 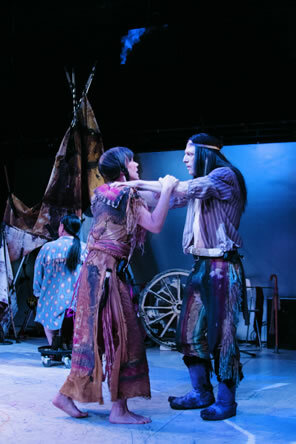 Of course, this childlike quality could yet be another perpetuation of Native American stereotypes—especially as their courtship scene degenerates into a ritualistic punch-up with Troilus physically overcoming Cressida—but, as with Mehrten’s playing of Pandarus, these vocal interpretations nevertheless reveal nuances in Shakespeare’s text. If that is admitting Wooster Group has successfully pierced my liberal weeny façade, I’ll accept that with the caveat that I’d still prefer to see Native American actors take on these roles. 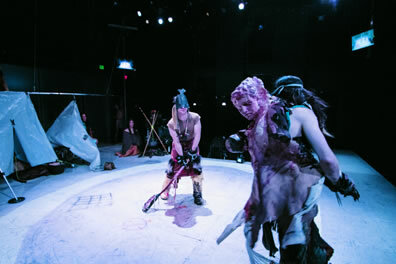 Diomedes (Ari Fliakos, center), wearing a black mask representing the Greeks, prepares to battle with lacrosse sticks against Troilus (Scott Shepherd) wearing his Venus de Milo armor as Cassandra (Suzzy Roche) and Adromache (Koosil-jain) watch in Wooster Group's production of Cry, Trojans! Photo by Tim Hailand. The play’s great moment of Shakespearean truth comes when Troilus, after having just spent his first night with Cressida, awakes to learn that she is to be sent over to the Greek camp in exchange for a Trojan prisoner. Shepherd captures the warring emotions of a man who has just consummated a long-held love, knowing all along that the love would not likely have a long run, and now realizing that it was, in fact, fleeting. He’s a man emotionally experiencing the most intimate touch of humanity at the exact same moment he encounters dehumanizing war policy and his intellect is assuring him that not only is his life doomed but his people’s existence is doomed, too. Troilus reaching his emotional climax in this scene could easily undercut his later climactic passionate outburst watching Cressida betray him when she gives in to Diomedes in the Greek camp. However, so much else is undercutting that Cressida-Diomedes scene in Cry, Trojans! Though Fliakos gives us a very human and even tender Diomedes, Valk is so determinedly stoic in her portrayal of Cressida (more stereotyping, perhaps?) that we see neither her true motivations nor her understanding of the consequences. Also, by this time, the Trojans have mingled so much with the Greeks that the black masks can’t clear up our growing confusion over the play’s plot. Most damning of all, by cutting out the Greek scenes in the first half of the play, Cry, Trojans! doesn’t introduce the bitingly cynical clown Thersites, played by Mehrten, until this scene. Because Mehrten uses his now-familiar sing-song delivery, even I, who know this play well, wondered why Pandarus had suddenly shown up spewing vile insults at Cressida in this scene. If the purpose of Cry, Trojan! was to infuriate us, it succeeded. I wonder, though, do LeCompte and company realize that our frustration may be more unintended than intended? Given the palpable “aren’t we cool and clever” aesthete surrounding the production, I suspect they don’t care. And that matters a lot to this theater purist.